Relationship Rebuilding After Infidelity - Elda M. Lopez - THE (IN)FIDELITY FACTOR. Points to Ponder Before You Cheat. There are so many questions asked after infidelity. Initially, the damage is enough to make anyone want to run away from the broken pieces, or, run straight at the offender with biting insults, copious tears and possibly flying fists (or whatever else may be available). Yet, after the storm a question might arise: Should I stay or should I go? Maybe too easy a term. Better yet, is rebuilding a possibility? If so, what does that look like? This is one woman’s candid recounting of “life after” and what that looked liked when this couple chose to remain married. Hint: Not one bit of easy and absolutely no quick fixes. I did not stay in my marriage. I am still married. The answer lies in the term “stay.” A simple word, but a deceptive one. After my husband’s affair, we decided to try to mend our relationship. Mending a relationship is a journey of healing (always), pain (unfortunately), honesty (ouch), hard work, vulnerability, more hard work, more honesty, and partnership. Staying in a relationship is something completely different. If you stayed in your marriage but still feel wounded, you know exactly what I mean. You cannot mend your marriage all by yourself. It takes both partners, fully invested in recovering from the infidelity and its destruction that betrayal pours everywhere, like seeping poison. And if your partner is not remotely interested in mending, then you have a choice: you can end the relationship or you can “stay” in it, knowing that it is injured and cracked. So what did we do? Oh, there are zillions of books and articles and websites that give the seeming magic recipe, but truly it’s an individual path like any type of personal growth. We went to couples’ therapy. We went to individual therapy. We attended a healing weekend retreat. We learned about communication. He explored the reasons for his betrayal. I explored my own self. He tried to figure out why he hurt me. We read “The Monogamy Myth” by Peggy Vaughan and “Mating in Captivity” by Esther Perel. He saw my pain, he shared my pain, he grieved over my pain. He worked through his issues and I threw things (okay, that didn’t help). I broke things (ditto). We yelled. We cried. We yelled again. We committed to brutal honesty. We lied. We told the truth. And above all, we agreed that we did not want only to “stay”. We wanted a healed relationship or nothing at all. I wanted his integrity or nothing at all. I do want to be careful here about seeming holier-than-thou. Some may interpret my story this way. But the infidelity conversation has to allow for good people making hurtful choices, just as it allows for bad people making hurtful choices. And why did we try to mend? Eight years later, I can barely remember. It was a complex reason having to do with love, kids, finances, shame (if we get divorced, what will our families think? ), stubbornness, hope, and 23 years of history together (good times and awful times) that were not ready to be stored away. Three months later, we could be tentative friends again. Seven months later, he moved back in. Two years later, we had recovered our marriage. Eight years later, my friends say, “I bet you guys never fight.” Are they kidding?! Of course, we do. We are imperfect. Our marriage has ups and downs, just like everyone’s. I don’t mean to imply that some paths are better than others. 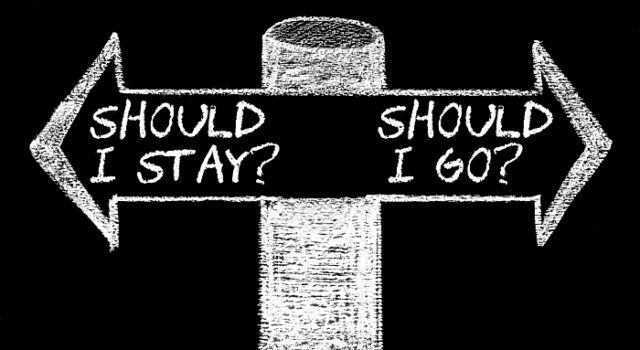 There are absolutely many valid reasons to stay, just as there are valid reasons to end it or mend it. I just want to be careful about the language we use. Recovery from betrayal is both powerful and exhausting, whether by yourself or with your partner, and in that shared pain we somehow, eventually, survive.